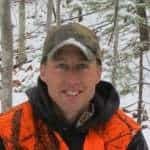 A Visit With Tony the Bear - the4pointer.com | Real Hunts. Unreal Stories. There are many experiences I’ve had in the woods that I’ll remember for a long time. Visiting Tony, the bear, at his den site is no exception. I wonder if Tony will look back at our visit as fondly as I do. My only regret is not giving him a bear hug when I had the opportunity (har har). There are not many in this world that can honestly say they’ve given a live bear a hug, and unfortunately I am still one of them. Such regret! 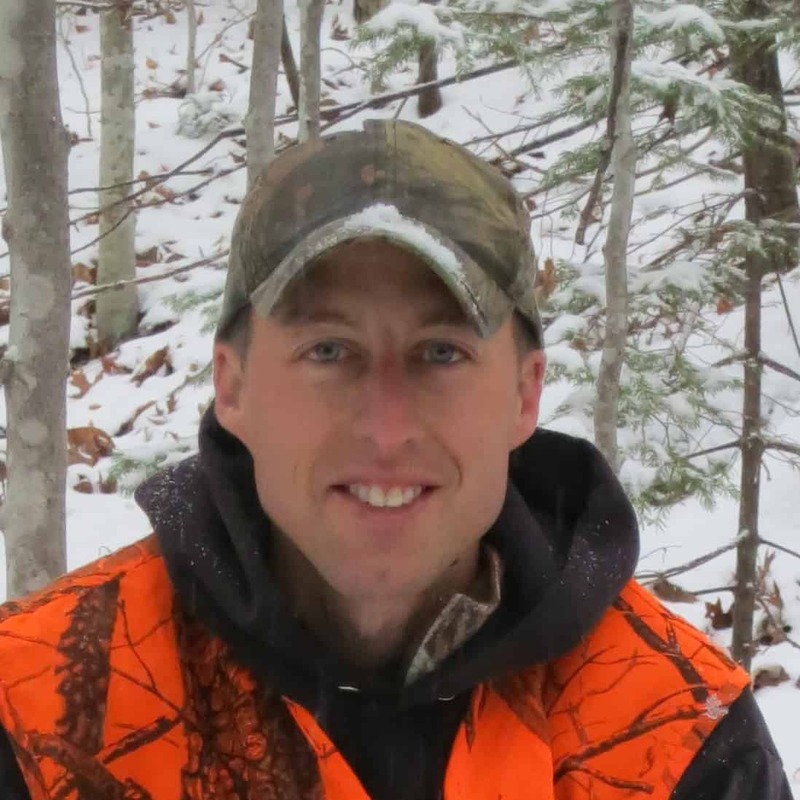 While Tony slept unsuspectingly in his den on the morning of our visit, the biologists and other team members gathered gear before we all met in a parking lot at the head of the snowmobile trail that led in his direction. 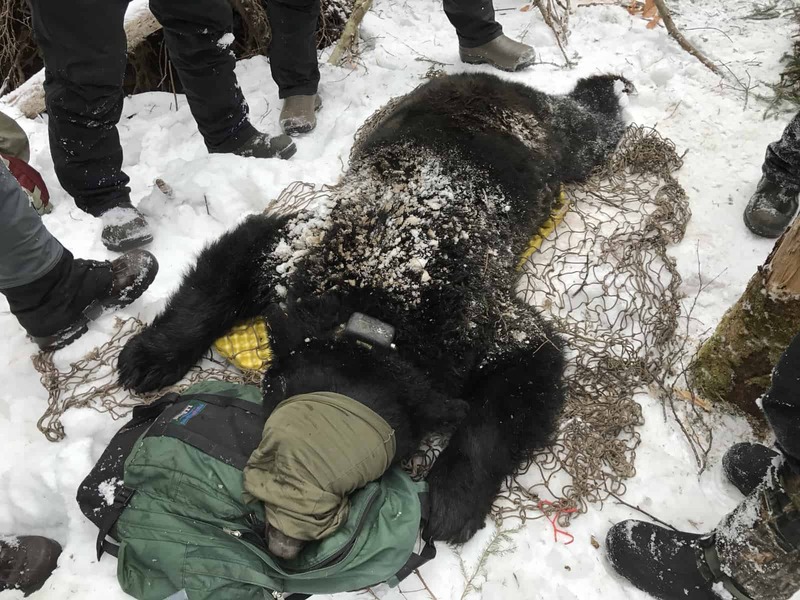 Insulated pads, tranquilizing equipment, a net for weighing, and an oxygen tank made up a small portion of the gear. Besides Tony and the experts on the trip, the star of the show for me was far and away the Wildlife Department’s snowmobile. It qualifies as a snowmobile, but certainly not a NEW snowmobile. As near as I can tell, it has to be from the 1970s or 80s, or maybe the 40s. I don’t know, I’m not an expert on the early history of snowmobiles. My other regret of the trip was not taking a picture of the vintage sled. If only I could go back in time! I’m not sure the Department would want a picture of the sled publicized anyway – sleds like that are in high demand and I’m sure the phone would be ringing off the hook by enthusiastic collectors if they saw the picture. Twenty-five yanks on the pull cord later and we were on our way. The recent warm spell had left the trails in rough shape, but there was sufficient snow (bearly) for our twenty-minute ride into the hills. A downed tree across the trail marked the end of our motorized journey and the start of the trek on foot. Tony, still sleeping soundly, was nestled at the base of a root ball from a tree that had fallen over about 400 yards away. The wind was in our favor and after a short instructional overview (be vewy vewy quiet! ), we were on our way again. Telemetry equipment is a fantastic way to locate animals in the woods, I have learned. The trick is getting them to wear the special collar that works in conjunction with it. 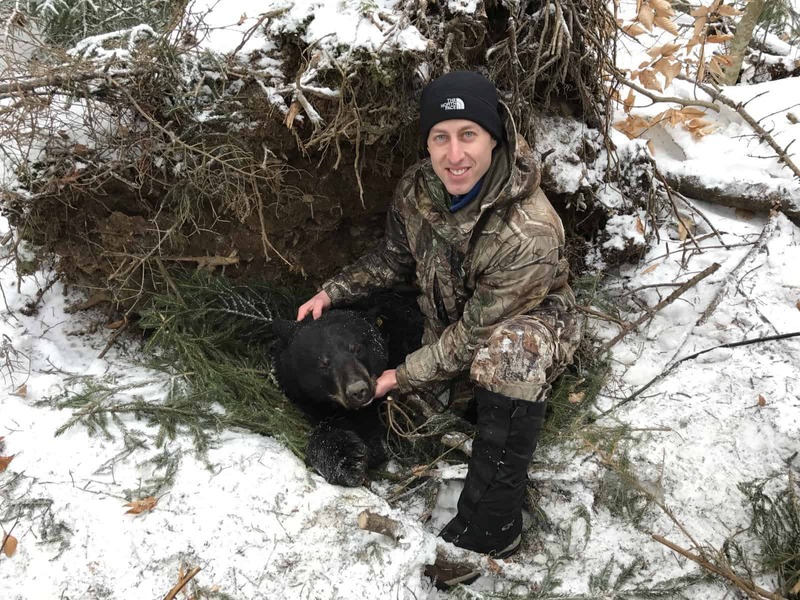 Tony had been captured in the late spring of 2016 as part of the Deerfield Wind Black Bear Study (read about that here). Tony is like me in that the lure of free food can distract from paying attention to the more important things in life. In his case, this meant being vigilant to not be captured in a culvert trap. Tony was not vigilant. It was at this point that the biologists slipped the GPS collar on him that was now leading us right to his location. Hopefully the sugary sweets were worth it to him. His den location, by the way, was very poor. I was surprised at how exposed he was. When we found him he was covered with a fresh layer of snow as he had very little protection from the elements. Not long ago he was likely covered in three feet of the white stuff! He was also settled into a depression in the ground that must have filled with water from time to time from the melting snow or recent rain events. It doesn’t sound comfortable to me! I learned on the trip that some bears are not very accessible for these visits. A few bears den in crevices often present in large trees, while others that den on the ground are too difficult to access. Tony was not one of these bears. If I remember correctly, Tony had been there since December. That means he slept through Christmas, the inauguration of President Trump, and the epic comeback by the Patriots in Superbowl 51. Man, he sure has missed out on a fascinating winter. Many people think that these bears are tranquilized with the use of a dart gun. This is not the case. The preferred method of administering the drug is with a “jab stick” that has a syringe secured to the end of it. 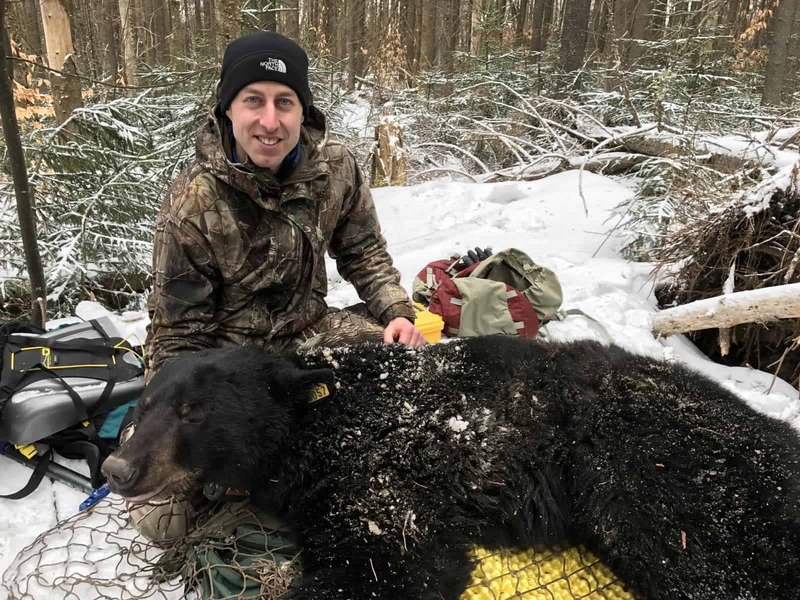 A biologist will walk up to the sleeping bear and poke it with the syringe, much like a human receiving a medicinal shot, minus the six-foot-long stick attached to the syringe, though I bet medical workers wish they could interact with some of their patients this way. The use of a dart gun is more difficult on the bear (or any animal) because the impact is harder, possibly leaving a bruise, and the dart has a barb on it so it doesn’t fall out after impact. As a result, the barbed syringe needs to be carefully cut out of the skin and muscle tissue. Needless to say, it’s best to use the jab stick, and I’d have to imagine it’s quite the adrenaline rush for the person holding it. The “non-essential workers” in the group (like me) had to hang back during this process because bears have been known to wake up from the noise of someone walking up to them. Maybe they knew I have a history of stepping on and breaking branches at just the wrong time? From what I’m told, administering the tranquilizer drug to a bear that is awake is little more difficult. Where is the sense of adventure these days? We were close enough to see the bear pick his head up after being poked, but he never left his den and was out cold barely five minutes later. After that, the work began. The majority of the work revolved around adjusting his collar and doctoring up any areas where the it had been rubbing against his skin. Tony had spent a lot of time in cornfields and oak stands last fall. As a result, he was seventy pounds heavier than when he was captured last spring, and the collar was a little snug. This, after having been denned up for over two months. He’d likely been even heavier when he’d settled in for his long winter nap. His temperature was 92 degrees F, he weighed in at a sturdy 218 pounds, and his teeth were checked over closely. Good set of chompers there. The biologists believe Tony had just celebrated his fifth birthday, which he slept through. There was no celebration, no presents, no cake – just a weird alien abduction experience as seven humans descended on his location and prodded him all over, told him he was cute, and stuck a thermometer up his wahoo. As far as I know, Tony wasn’t awake for any of it. If he was, he wasn’t a great conversationalist. 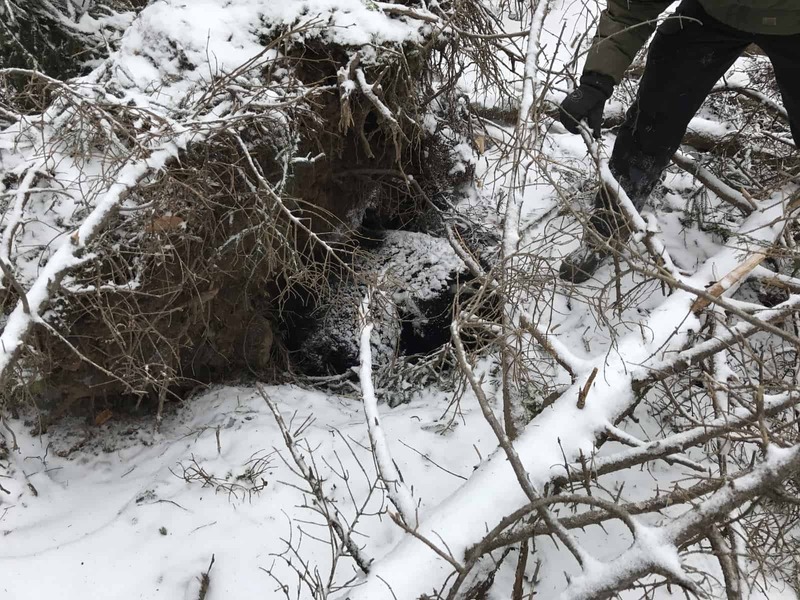 After we all took pictures with him, Tony was carefully positioned back in his den site for the remainder of his winter nap. He’ll be surprised when he wakes up at how much his den was improved from when he originally fell asleep there last December. 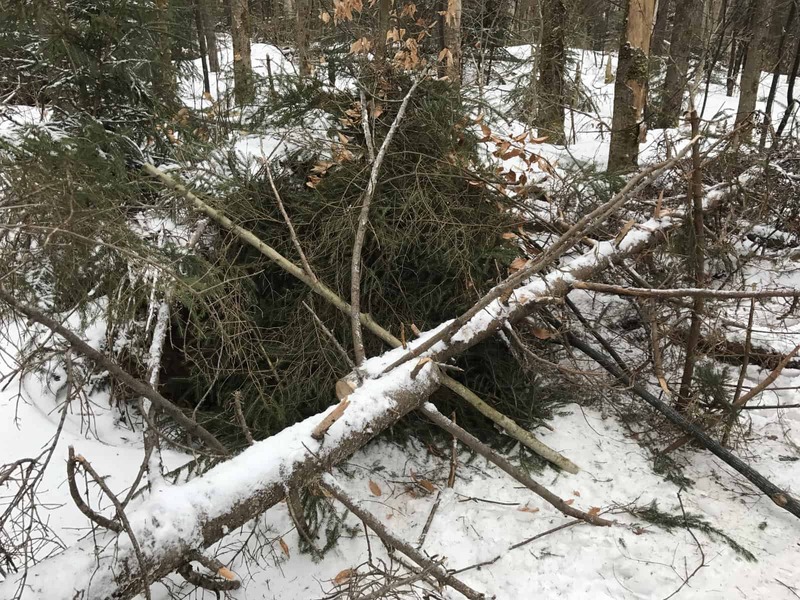 We laid saplings against the root ball of the tree and created a roof over him with spruce boughs so he would be better protected. You can thank us later, Tony. With the work completed, we backed out of the area and reconvened at the snowmobiles. Twenty-five yanks on the pull cord later and we were on our way back to the vehicles. I will say, one advantage to a snowmobile that was manufactured in the 1920s is that it very light compared to its modern day counterparts that come equipped with frills like hand warmers, a suspension, and more than one cylinder. Turning it around by hand was no problem at all. I would have thoroughly enjoyed the opportunity to pilot that baby on the trails, but I never asked for the chance for fear of robbing someone else of the thrill. Plus, I didn’t think I was certified. Thanks for taking the time to read about my bear adventure. Quite a bit if you take the time to read the study that I linked to in the article. I’d say Tony is still working his way through life, not necessarily developmentally disabled. 😉 The fella clearly knows how to eat and survive, just needs to learn how to choose a better den site, even though he was clearly in healthy shape when we found him. Nice article, as always. You would think a good grant writer would include a snowmobile in the grant application. Next time. Do they monitor to see if Tony moves after the experience? I’m glad I’m not a grant writer. I’m content raising awareness for the need. I meant to ask that question about whether they monitor to see if Tony moves after the experience, but totally forgot. Not sure if the collar sends a signal frequently enough to be able to tell. I’ll have to ask!